A few months ago, a good friend of mine found out she was expecting baby number 4. Both of us being sewers, we immediately talked about what to make for baby. I asked her if there was anything I could make and she said a quilt. A few weeks later when she found out she was having a boy and she sent a few pics my way of what kind of quilt she wanted. 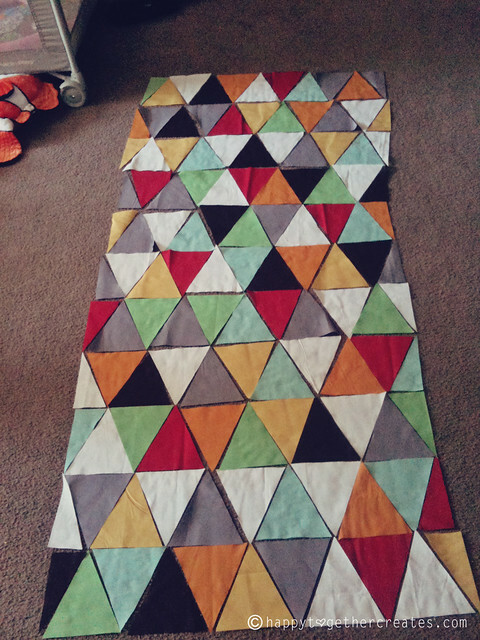 A triangle quilt it was! They are quite the rage at the moment 🙂 We discussed colors, to use batting or not, and size. She decided on the above colors with a stripey binding; no batting (since she lives in Florida which is a rather warm state); big enough to cover the crib mattress for when it transitions into a toddler bed. I went to the store and bought some fabric and made a quilt. I had done some measurements wrong and it wasn’t quite wide enough and I just wasn’t digging that color scheme, so I went back and bought more fabric and adjusted the size. This is what came of it. I’m going to share how I made it in case anyone is interested. I’m not a super quilter or anything and there might be better ways to do some of these things, but I like to live and learn with my sewing 🙂 and this is how I did it. I can say for sure, you will need 2 yards for the backing (with no extra, I just added that extra triangle line for interest) and .5 yards for the binding. The rest just depends. Here is a breakdown of what I used and I had some leftover, but it’s good to have a bit extra just in case you need it. I didn’t use any batting, but I’m sure there is a crib sized one that would work, or you just buy one that is bigger and cut it down to size. 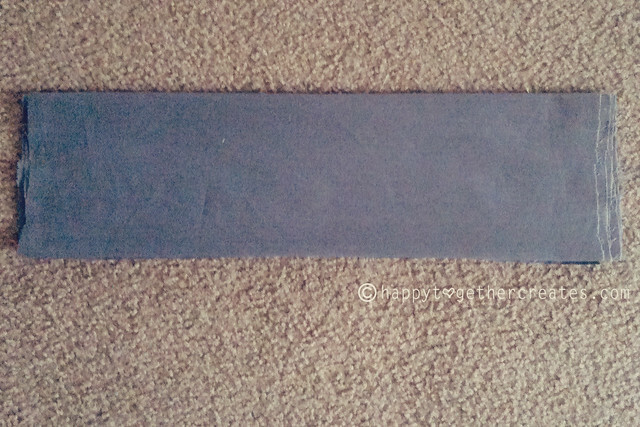 The triangles will be 6.5″ high and 6″ wide at the bottom. There will be 11 rows of 17 whole triangles, where as the two on the edge will be cut in half during the trimming process. 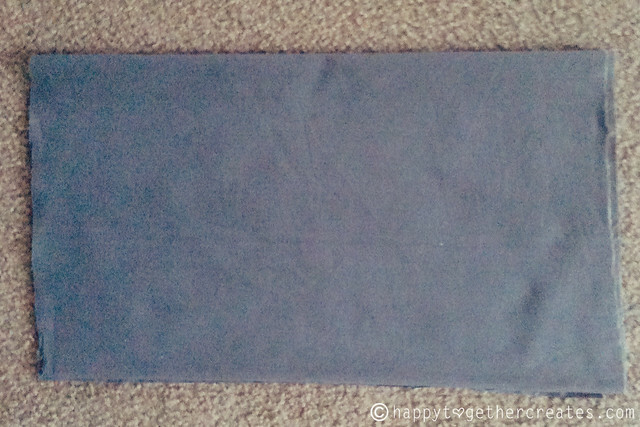 The binding needs to be 180″ long and 2.5″ wide (or width of your preference). I will not share a tutorial on how to make this as there are tons out there already. Simple search “how to make quilt binding” and you will find many ways to determine which one fits you. 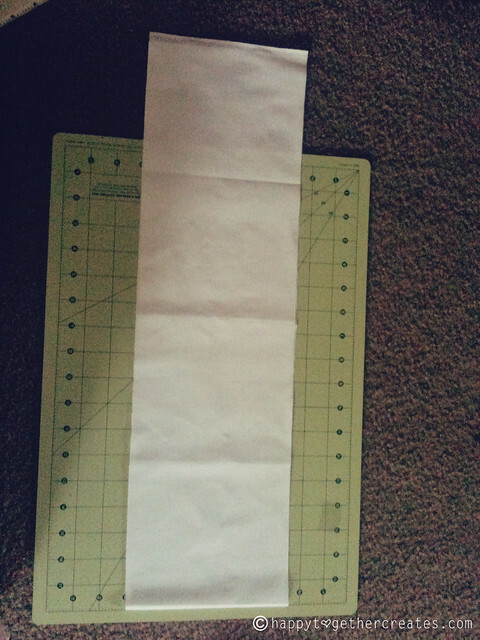 I will show how I cut mine though, as I did not do it on the bias which might require more fabric. 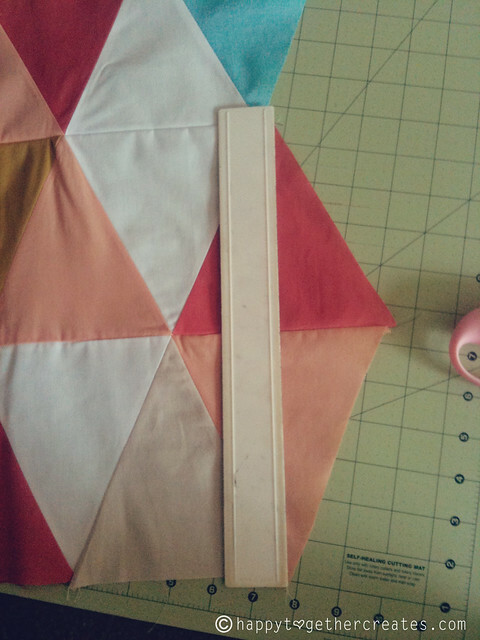 To cut the triangles, I started with my fabric piece and starched it. This helps keep its shape a lot. Trust me. I didn’t do it on the first and noticed a big difference. I folded it in half (this is where is was folded on the bolt). 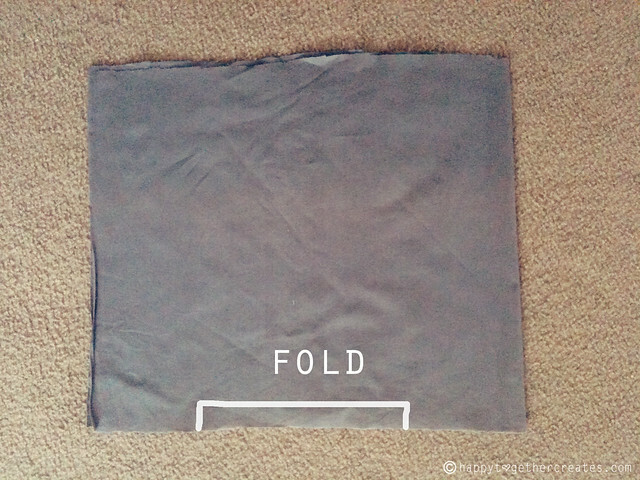 Then I folded it again in the same direction. Next, it was time to get rid of the terrible unmatched ends. 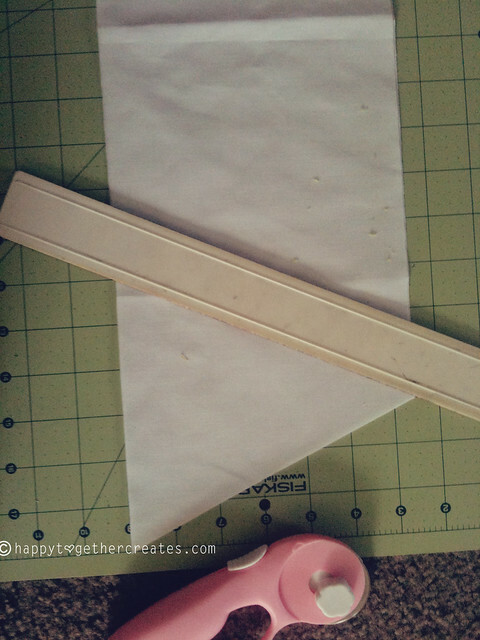 Using the equipment you have, trim off the uneven edges so it’s even. 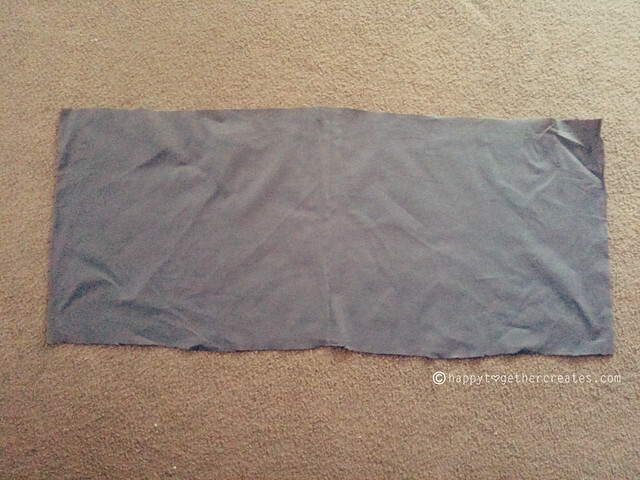 Then go down the folded piece of fabric and cut in 6.5″ pieces all the way down. Get as many pieces cut out of it as you can. 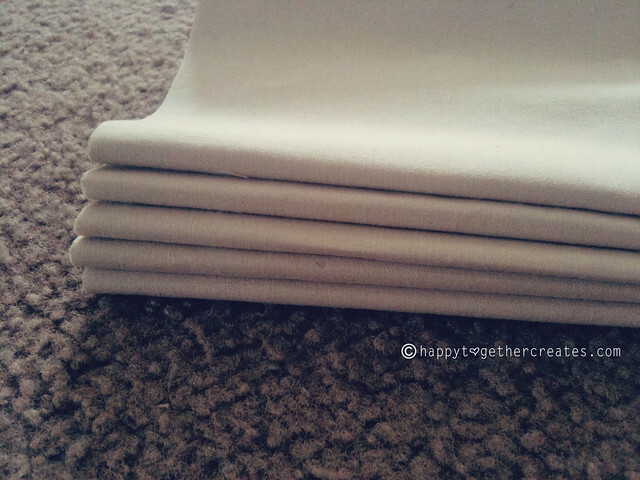 Stack them and put them to the side and do this with all the fabric pieces you are using for your triangles. Once that is all done, open up one piece so that it is folded in half only. 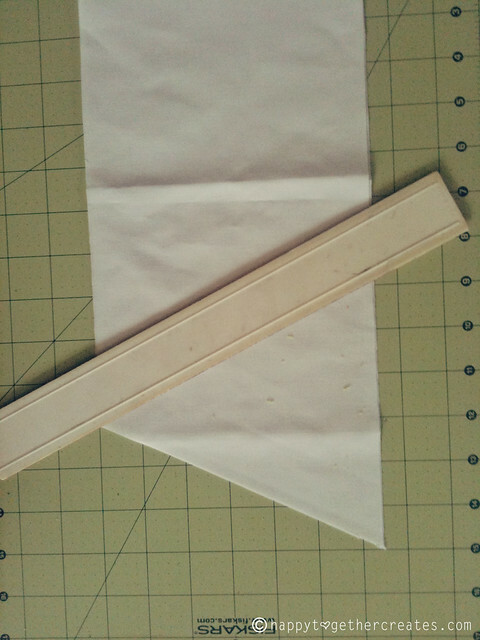 Then I continued cutting triangles, but now the fabric isn’t folded, so it needs to be the whole triangle size. I made the angle so that there were six inches across at the bottom and it hit 3 inches over at the top. Continue cutting triangle like this until the end. When you get to the end, you will have some extra usually. So you might just want to cut half triangles to use on a different project. Maybe make a matching pillow or use on the backing. Now lay them all out on the floor for how you want them to go. I just randomly placed them pleasing to the eye. This pic above was from the first quilt I did. You will need to have 11 rows of 17 WHOLE triangles in each. We will do the trimming at the end instead. I just forgot to take pics of this part on the 2nd quilt. Once they are all laid out, I stacked them in order and then put a sticky note for which row it was. I made sure to start with the same end on each row so it all matched up how I wanted it to. 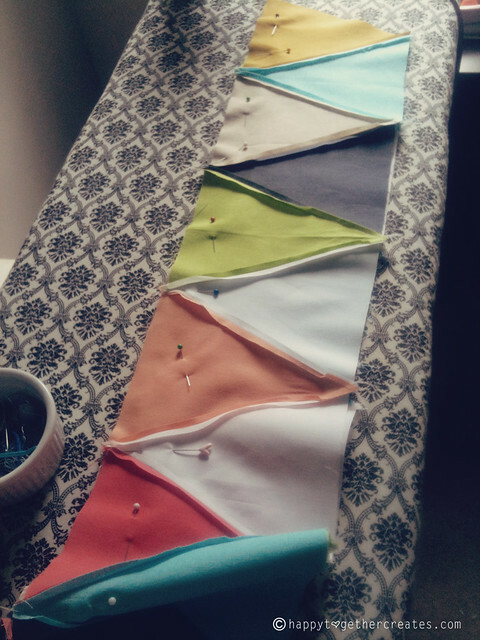 Then stack them however you like and take them to sew. 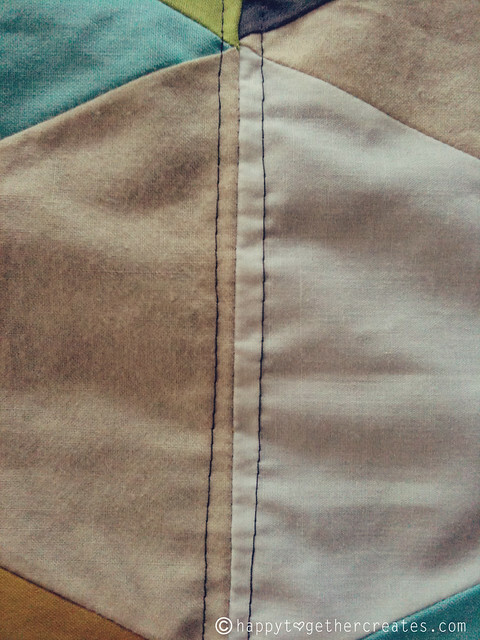 Sew the triangles in a row together, about 1/4″ seam allowance. I did mine a tad smaller though. Make sure to keep them in order. Once done, press open the seams with iron. Do not actually slide iron along. Just hold it down and pick it up to press. This helps it keep its shape better for matching up the rows later. I kept the note with which row it was on each one so I didn’t misplace one. 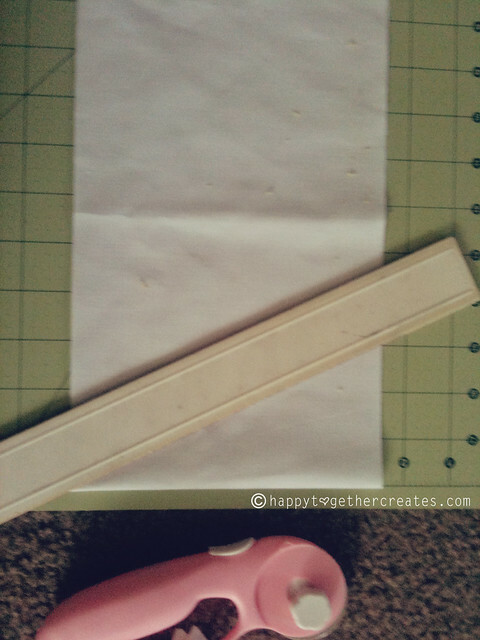 Keep in order while sewing the rows together. Now start to sew the rows together. 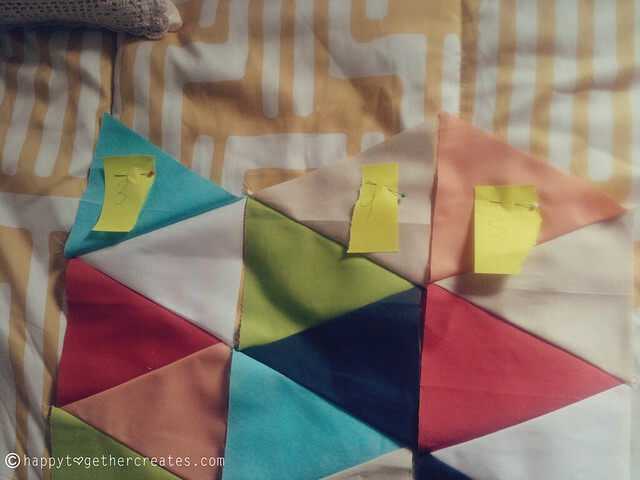 Start by pinning rows 1 and 2 together, making sure the triangle ends meet each other. Once sewn, press open the seam. Next sew rows 3 and 4 together. Then sew 11 onto 10. 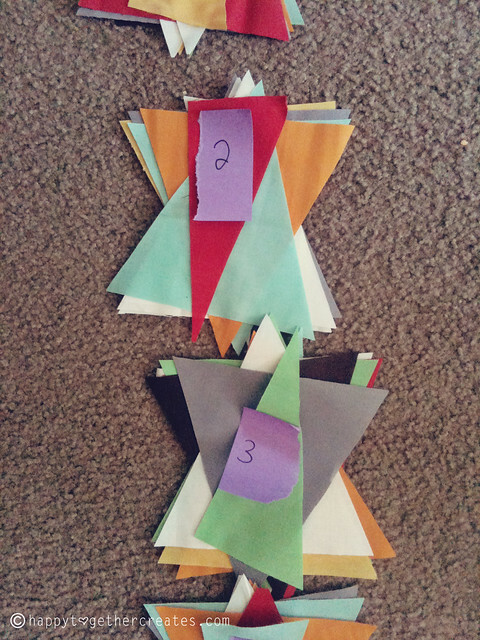 Then sew the first group (1&2) to (3&4). Sew (5&6) to (7&8). Sew (5,6,7,8) to (9, 10, 11). Then finally sew (1,2,3,4) to (5,6,7,8,9,10,11). 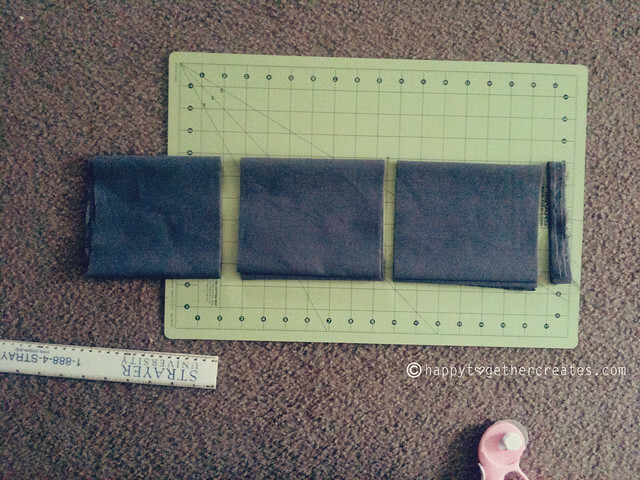 This helps keep the rows straighter as opposed to just sewing them all together starting from 1 and working on down. Now trim the edges. Just even them out two at a time. Next place the backing down on the floor, wrong side facing up. You only need the 2 yard piece. If using batting, add that next. Then place the triangle top on top of that, right side facing up. Pin the three layers (or 2 in my case) together as you prefer. 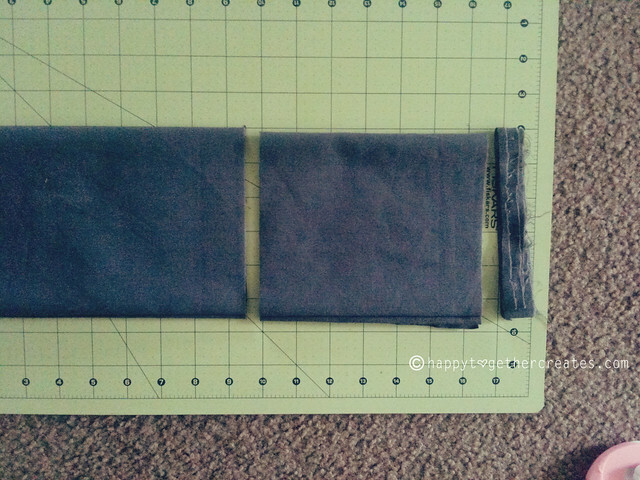 Next, I sewed above and below each rows seam only (width wise). You could do more, but this was good enough I felt. 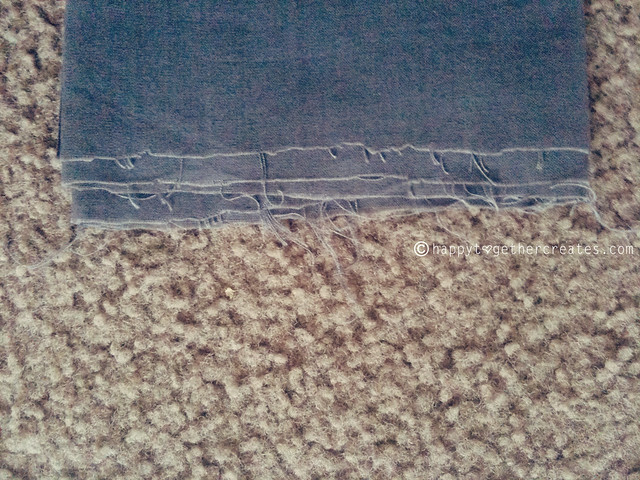 Then to keep it in place, I also sewed down the top and bottom edge to the backing. Then I finished by trimming the backing that was poking out on the sides. When it’s all done, I like to throw it in the washer to help it get started with that crinkly comfy look. That is one of my favorite parts about quilts. I love it! I wanna pin it! I love the colors! I finished a chevron quilt in March! It was similar to how you made this one! Thanks for working so hard at putting a post together for it! LOVE LOVE LOVE this quilt!! I love the colors, the binding, the back, everything! Beautiful. I love this and now really want to make one in similar colors for my son! The colors really are perfect! Great job! That looks great! I still can’t imagine a quilt with no batting, even IF I live here in SWLA. LOL But it looks amazing. And the stripe binding is perfect for a baby. It will dazzle his eyes! You should do it sometime 🙂 It makes it more cost effective too! lol. I have made all of our quilts this way so far. They don’t get as crinkly looking, but it’s great for these hotter climates. I had a friend in FL who quilted, and while they were stationed in Hawaii, she said none of the quilters there used batting at all. But when they were stationed in Alaska, everyone did. 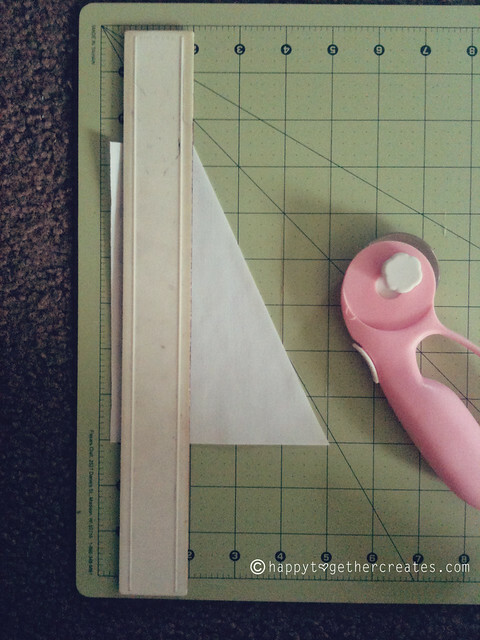 with your first piece of fabric that you folded for cutting the stripes, what size was it and does it matter or do you fold it to trim the edges and the cut 6.5 inches ? This is so sweet. 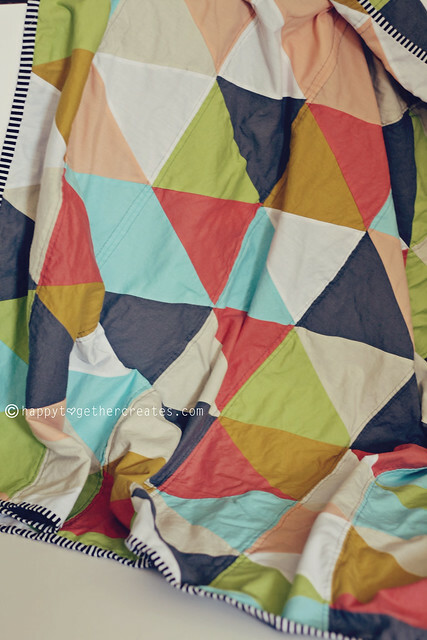 I want so badly to make a quilt and this is perfect for our next little one! Keep writing! When your blog has attracted too many followers to pretend it doesn’t matter because no one’s going to see it. You’re friend is so lucky because that is a lovely quilt! Looks amazing. Thanks for sharing all the details with us. I love how your quilt turned out! Thanks for sharing this tutorial!! This is just beautiful!!!! You should sale them…I can tell it took a lot of time but what a perfect gift!! Great tutorial. Thanks for sharing. I’ve been wanting to make one of these and now I know how much fabric I need! Holy smokes. This is a beautiful quilt!! It seems elaborate, but doable. Is it strange that it seems both? 🙂 I made a puff quilt for my baby girl, so I’m sure I could pull something like this off. Thanks for an awesome tutorial!! Thanks so much for this tutorial! My Grandmother was a quilter, and I had the chance to help her when I was younger with the hand quilting side of things, so I feel comfortable with that, but… after her passing over a year ago my mom gave me a bag of fabric from Grandmother’s items. I just went to look through it last night to find fabric for the “Fabric Letters” I’m going to make for my son’s first birthday present. 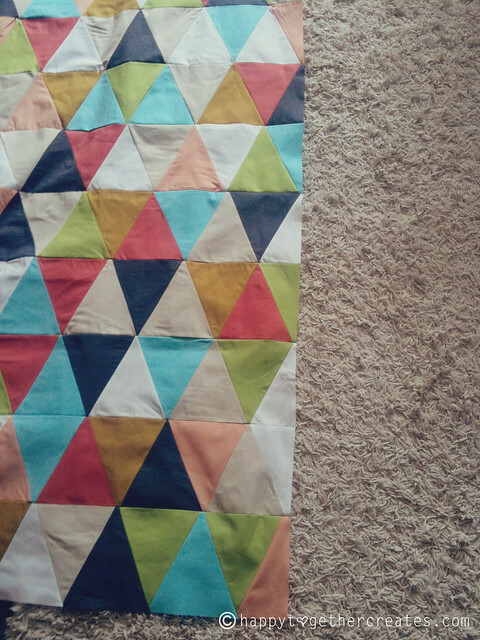 Anyway… I found a 5 piece strip of triangles sewn together. I cried. 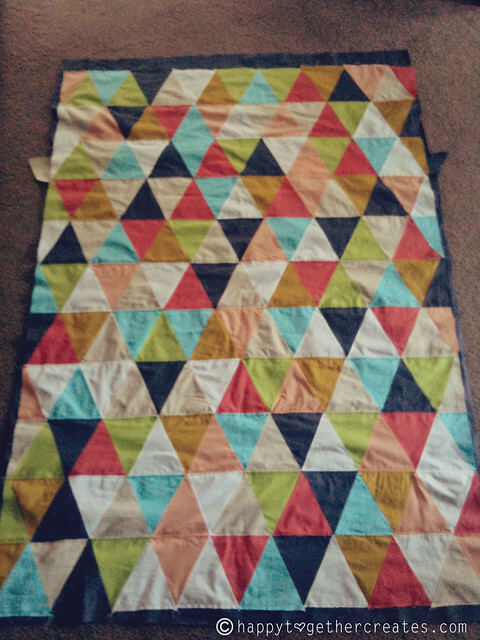 I want to use her scraps and make a triangle quilt just like she did. I have a quilt she made specifically for me, but was not able to get a utility quilt, we have a BIG family. … She called her triangle quilts “UTILITY QUILTS” … made mostly of fabric scraps (you could look thru her quilt and pick out your sunday dress or your christmas pi’s, or bedroom curtain) Her utility quilts were printed fabric triangles going one way and solid white going the other. They make me smile! Again, thank you… this will help me make one to mimic hers!! You are so very welcome 🙂 How special that you will be able to carry on her legacy through sewing. I know that the quilt you make, and whatever else you make from that fabric, will be the sweetest ever. Love this! It looks awesome! Thanks girl 🙂 It was fun to make! This is great! Thanks for the step by step. I think I’ll take a whack at it! Did you just use cotton for the material? I’m on this! I am very interested in making this quilt but I was wondering what type of fabric you used. Is it just 100% cotton? Also, where did you buy your fabric because I love the colors you used. Thank you! Hi 🙂 Yes, I just used regular cotton fabric. 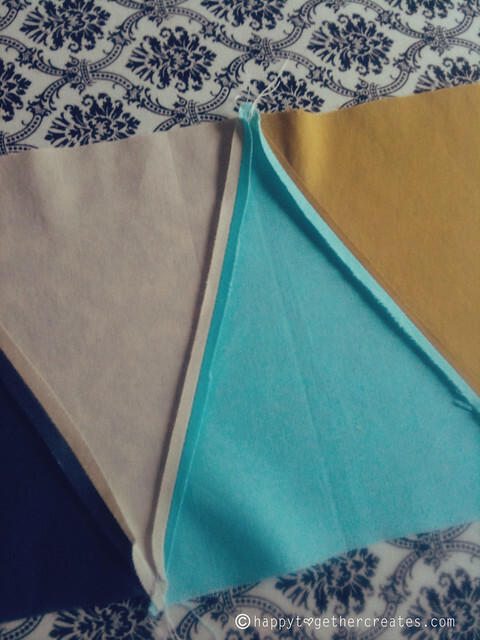 I went to the section in the fabric store with the solid quilting cottons and batistes and just sat pulling out colors until I found the color combo I liked. So, some fabric was thinner than others since it all wasn’t from the same line, but you can’t tell at all once it’s all together. 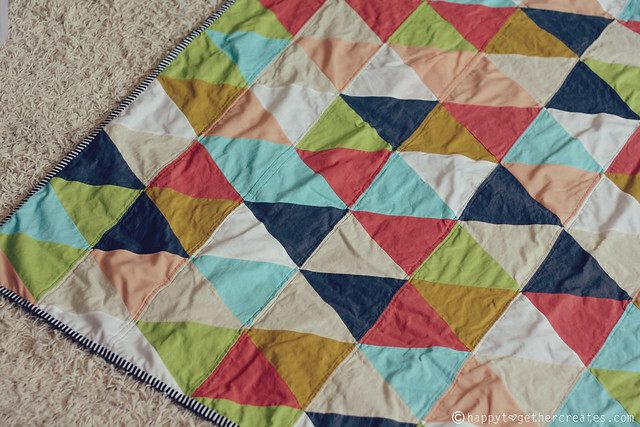 What an adorable quilt, love the triangle and colors, thank you for sharing the tutorial!! I love this quilt! The colors work so well together. Thank you for sharing it with us. Thanks for the tutorial- looks straight forward and very helpful! 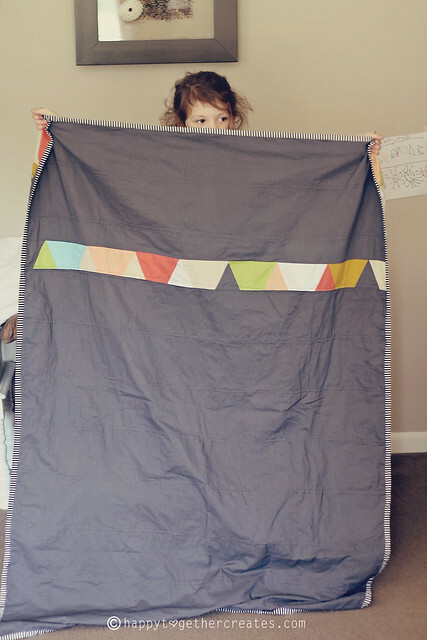 I’ve never made a quilt before and I’m about to attempt a triangle quilt for my baby boy and this has given me the confidence. Love the quilt! Where do you get your fabric? I just went to Hancock fabrics, stood in the area with all the solid cotton quilting/batiste fabrics, and just pulled out what I liked 🙂 It took me a while to get a good combination of colors I liked though. I Love it! My sister needs one for Christmas! What did you back the quilt with? It doesn’t look like regular cotton? Did you buy the stripy fabric at Hancocks too? That’s really frustrating. Le sigh. Hi all 🙂 I just wanted to let you know that it’s okay! I actually do not mind people making things using my tutorials/patterns and selling them. I just don’t ask that people claim it’s their original idea 😉 But, it happens I’m sure! lol. This quilt really is a compilation of a few that my friend showed me anyways (in the color department) because that is what she desired. I just wanted to share the measurements and all so someone could make one any way they wanted 🙂 I do appreciate the loyalty! Thanks for the tutorial! I think this will be a great beginner quilt for me to conquer! Loving this quilt and your tutorial! I’m not a quilter. I made one before years ago, just a block one that I totally guessed my way thru! Will let you know, once I get started! Thanks for your time putting this together for us!! Thank you so much for this tutorial! I am in the process of trying it now. I start sewing tomorrow night. 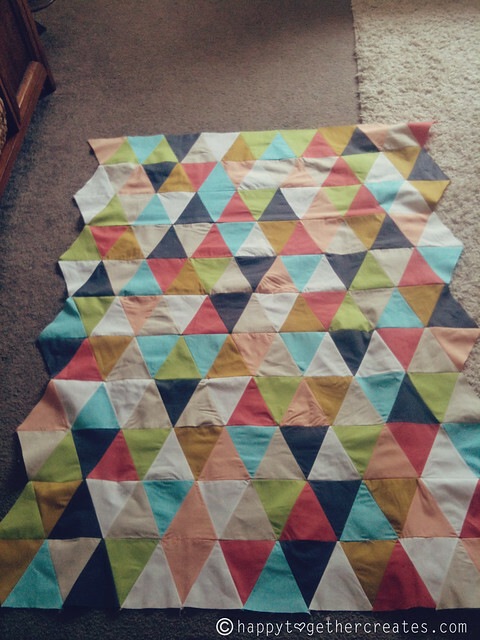 I do have a question though…do you have to back stitch each time you sew a triangle together? Thanks so much for your help! You are welcome 🙂 I did not because I wanted to go as fast as I could lol. But some people do. I would backstitch if I was doing really small pieces and wanted to make sure it didn’t come undone at the ends at all. I say do a few and see how you feel about it. I found this through pinterest. I adore it! Very modern, and I love that it doesn’t have batting. Perfect for hot summers. OMG! This is gorgeous! Love the triangles and the colors. Thanks for sharing this tutorial…although I’m not sure if I can ever to this! This is fantastic! Did you wash the fabric before cutting it? Thank you 🙂 I am lazy and did not! lol But, I would suggest always washing any fabric that you know or think might shrink. I knew this kind of fabric would be okay so I didn’t. Wow that looks like so much work! How long did it take you? It sure is a lot of work, but not that difficult. I worked in shifts to make it go quick. One night I cut the fabric and laid it out. 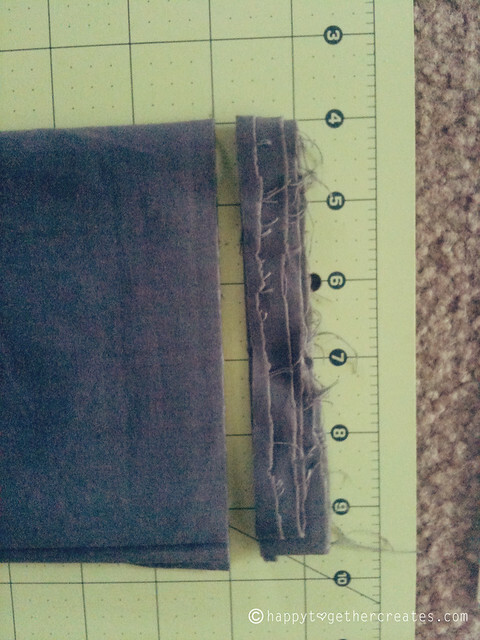 Next, I sewed half the rows….and so on. I’m not quite sure how long all together because I worked on it an hour here, an hour there kind of thing. But, I would say at least 5 hours all together. Maybe a little more. Love this! Found it on Pinterest and seriously adore it. I’m not a sewer or quilter but this makes me want to be! 🙂 If you ever start selling quilts I will be first on the list for this bad boy. Thanks for sharing! I’m new to quilting/sewing and am going to start a triangle quilt this week. Can you please explain what you used to starch the fabric and how you did it? Thanks! 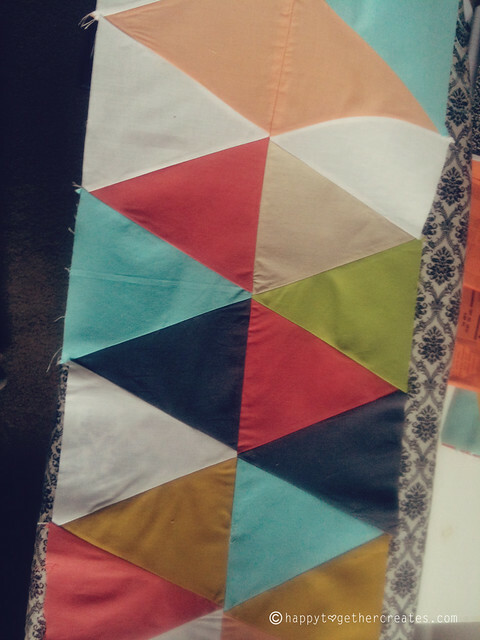 Yay for starting to quilt! I used Niagra spray starch that we picked up from Target. The type you buy will have directions, but you spray a little on, let it sit a minute or two, then iron. It’s really not necessary if you are using the good thicker quilting cottons, but a lot of my fabrics were on the flimsy side so it helped a lot! 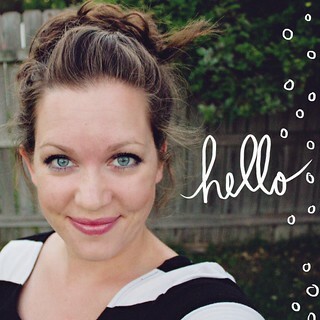 I finished mine today and posted a pic on my blog! 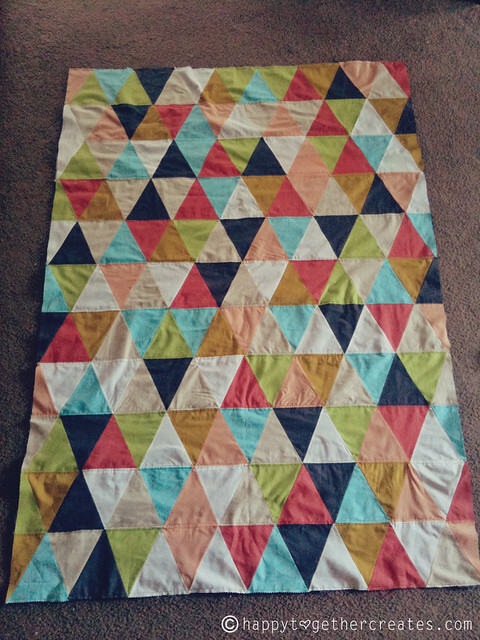 Your instructions are great and were super easy to follow for my first quilt!! Hi, I was wondering if I could pay you to make this quilt for my baby? Please email me back at jaclynfodo@yahoo.com if you are interested. Hi 🙂 Mine are cut off as well, but not so much that it is really noticeable once all together. 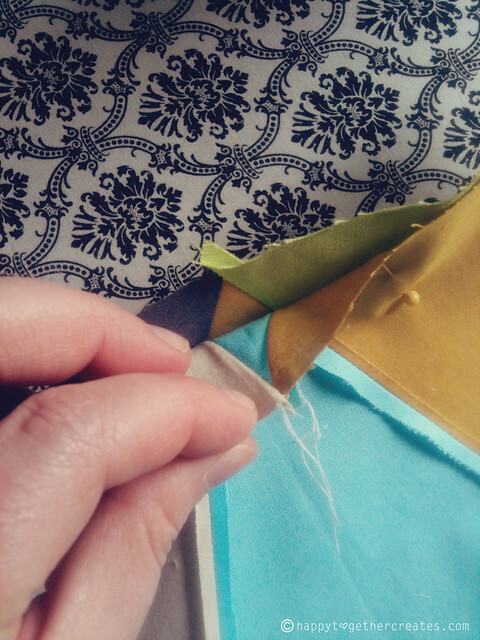 If you really want more of the point, you will need to make the triangle a little taller (to keep this size) and when you sew the individual triangles together side by side, the pointed ends should not come all the way to the edge of the triangle its being sewn to. 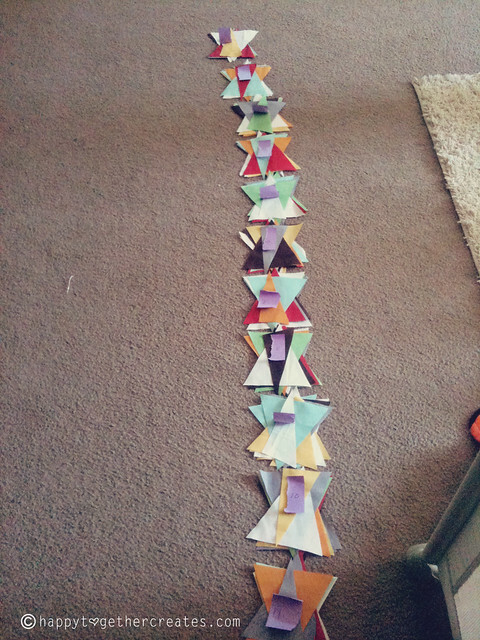 So, the triangles when sewn together, would not be even and would need to be trimmed before sewing the rows together. This gives you space in the seam allowance so the point is seem more. Do you know how your quilt has held up after washings? I am assuming it has been machine washed since it is for a child. Would you ever make another blanket just like this one and sell it? Thanks for posting this, Jess. I was looking for a technique to make comforter covers for my kids to take to college – something simple that I could make largely with my existing quilting fabric stash. This approach should work great. Thanks! Hello! I made 2 of these(as a result of your tutorial),for 2 of our Grandchildren, both born 5 1/2 years ago in the USA, while we were still Missionaries in Belize C A . My choices for fabric were limited, however, the quilts turned out so, so darling! 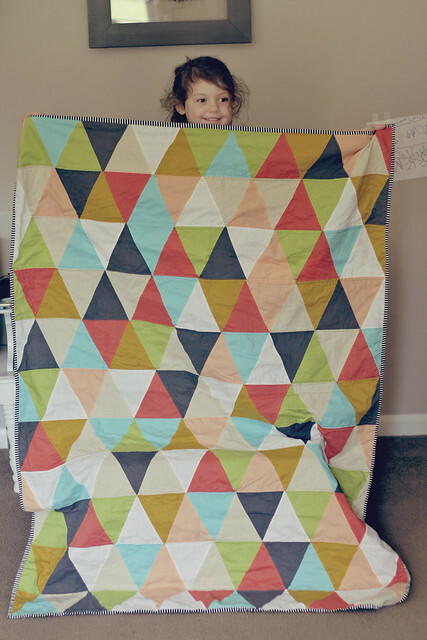 This week we have been blessed with our 5th Granddaughter(3 days old now), and I was searching everywhere for this tutorial so I can start another of these quilts ASAP – thankfully I checked my Pinterest Pins from 2012 and finally found what I waslooking for – YAY! When I am finished with this one I will make 2 more for the older Grands who don’t have theirs yet. 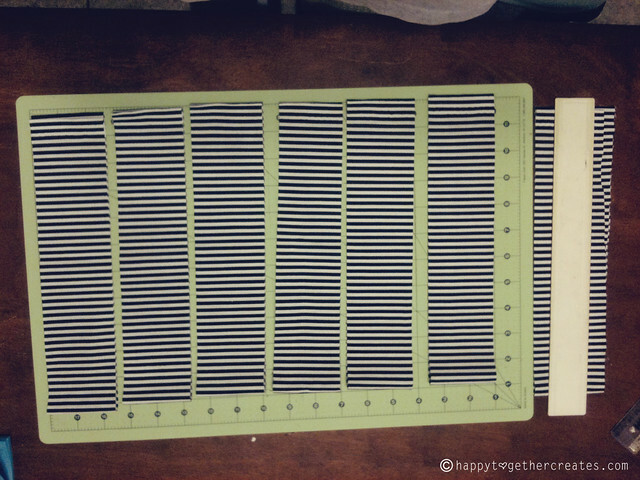 I love the black and white stripped binding, and how chi’c it looks with the bright colors I choose to use – thank you so much for sharing this simple pattern for woman as myself to use, who enjoy sewing and like to keep it uncomplicated, too!